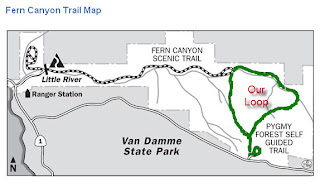 Today's MCLandLoper's hike was the 3.5 mile upper loop at Van Damme State Park. It was raining in the early morning so the hike was called off but I saw blue sky over the ocean and decided to go anyway. I arrived at the trailhead and Peter, another member, had just arrived. The rain stopped, the sun started peeking out and away we went. Perfect! This is the boardwalk through the Pygmy Forest. The boardwalk solves the erosion problem this type of soil is prone too. You can see an example of the erosion problem via the red link. After the boardwalk the trail starts to decent into Fern Canyon and zoom! Another MCLandLoper whizzed by but she is a young member and wanted to run. Away she went as Peter and resumed our walking gawking and yes, talking! Peter told me a lot about this area because he is a member of the Jackson State Forest Advisory Board and has been involved with various decisions about this park. This was a former logging road and is maintained by the State Park for access when building/repairing bridges or clearing big trees blown down by storms. One of the recently improved bridges. The remains of an Amanita Muscaria. Peter told me deer eat them! A tributary of Fern Creek. This area was heavily logged of redwood and, over time, fir grew in. Now there is a disease killing the fir and high winds knock them down. Not a good idea to walk this trail when it is windy. This stump gives you an idea of the original redwoods in this area! Looks like a great walk! Are those Nordic Walking Poles in your hand?